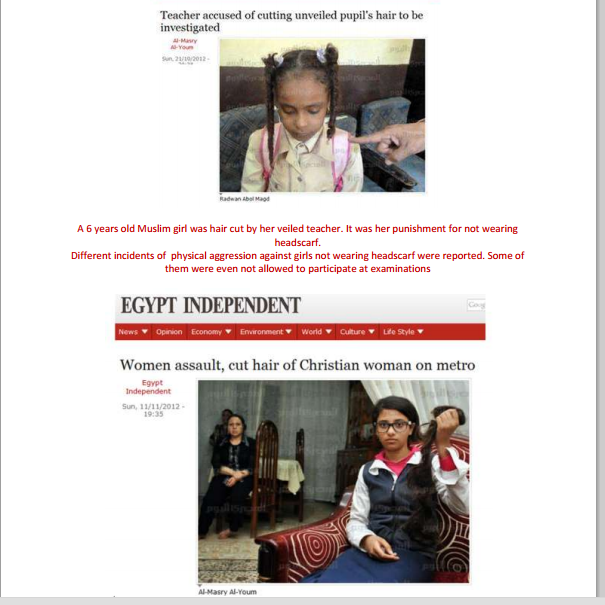 Sisterhood in Egypt also have their own way in terrorizing both Muslims and Christians who don’t relate to Brotherhood Organization. The punishment by Sisterhood is cutting girls hair! Muslim Brotherhood Organization and their supporters are constantly violating all Human rights in Egypt, specially against women and children. Brotherhood are addressing a fake speech to the world that they are peaceful and moderate Muslims. This is absolutely not correct. The reality on the real ground in Egypt doesn’t really match with this statement of theirs! Brotherhood Political Party members and leaders are the same members and leaders of the Brotherhood Organization. Their supporters are practicing violence against anyone who refuses their violent practices. Brotherhood attack physically anyone who participated in the 30th of June 2013 Revolution. Every time Brotherhood supporters are protesting in the streets, if any passer-by or any car drivers don’t raise the yellow 4 fingers Rabaa Symbol and declare that he/she supports Mohamed Morsi (former president), they get attacked right away by Brotherhood supporters in the streets and they end up by serious injuries or lose their lives. Brotherhood don’t just use their hands in attacking others, but they also use gunshots. Muslim Brotherhood think that Terrorizing Egyptians will bring them back to power! On 12/11/2013, a Brotherhood Teacher in Sharqia City in Egypt tortured a student in the school because he wanted to play a national song while students were saluting the Egyptian Flag in the school Yard. The Brotherhood teacher has beaten the student in front of his colleagues and the brutal torture and beatings resulted a hole in the student’s ears and he may also face a permanent disability. Student also got serious bruises all over his body. The Teacher got suspended from School and the case is handled by the concerned authorities. On 13/11/2013, a Brotherhood Sport Games Teacher in Al-Minia Preparatory School for Girls, has beaten 25 girls students and dragged them on the ground because they told him that they admire the Ministry of Defense’s courage in standing for his own people’s will on 30/6/2013 revolution. When the Mothers of the students started to notice bruises and injuries on the girls faces and backs, they questioned their daughters and learned about the teacher practices and threats against their daughters. The teacher threatened the girls if they open their mouth, Brotherhood Organization have armed militants and they will kill the girls and their parents if they dare mention anything about the teacher practices. Lawyer Azza Saad a mother of one of the students, got agencies from the other parents and filed an official complain to Abd ElMoneim Abu Zeid the Director of Al-Minia city Educational Administration and raised a court case against the Brotherhood teacher. The Teacher got suspended and the authorities are handling investigations. Video published on 7/10/2013, Brotherhood students in Al-Mansoura University making a chaos in the street, terrorizing shops owners, destroying shops, cars and private properties. Brotherhood Students appear in the video throwing broken Glasses at the passers-by. They also attacked a handicapped old man and beaten him and left him lying on the ground. That’s what the International News Medias and AlJazeera of Qatar describe till this minute that Brotherhood are very peaceful protesters and they are the ones who are oppressed!